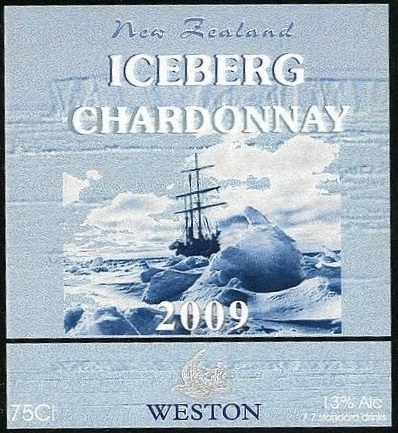 Virtual New Zealand Stamps: New Zealand Wine Post - Wine Labels. Why a collection of wine labels on a blog about postage stamps? Weston's Winery is a small winery located close to Dunedin in New Zealand's South Island. They were among the first to establish their own postal service when New Zealand deregulated the postal environment which opened the way for many small local posts to be established. The first New Zealand Wine Post (WinePost) stamps appeared in late 1990 and have continued to the present day. Along the way, many fine stamps have been issued. You will have found my series of posts on New Zealand Wine Post, well now I want to add one more page. This page goes back to the very early Weston's Winery labels and follows them through to when the WinePost started designing stamps. Those who have taken the time to study these stamps will notice similar themes and designs here. There is a progression from the earliest wine labels right through to the latest stamps. I believe this page gives my WinePost pages some history, perhaps you might say pre-history. Where there is a very obvious connection between a Weston's Wine Label and a Winepost stamp, the stamps have been included here for comparison. Note: - I intend to only provide links to this page via the pages of our WinePost collection. 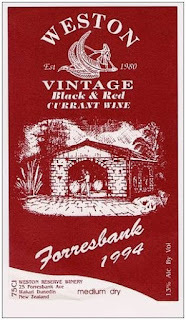 1976 Primitive forerunner winery label. Here she is, The Guernsey Lady. 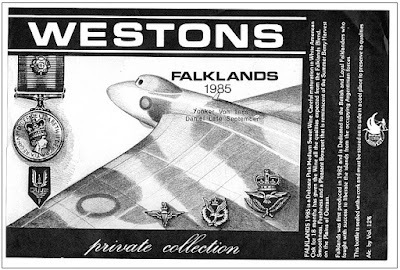 This Pre Weston's Winery wine label dates from 1976 and was the first wine label ever produced, well before the winery at the Berwick St location. This was a raisin wine that was very popular and eventually led to the winery operation. Hand-drawn and produced by photography. The label would have had the backing stripped off and hand glued to the bottles. The Guernsey Lady is Jane Lewis Valpy, an important ancestor of the Weston family. 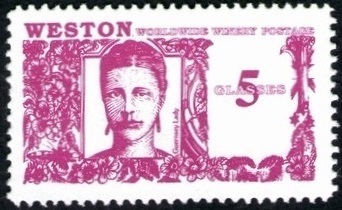 She appears again in the third Wine Post stamp issue in 1991 and one of the wines shown in the 1992 'Summer Wines and Flowers' definitive issue is also named after her. 1991 - 5g The Guernsey Lady. 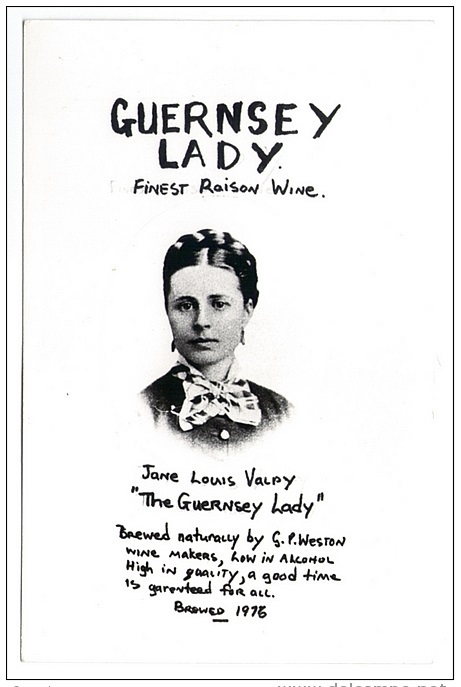 1992 - 2g The Guernsey Lady Wine. 1977 Primitive forerunner Flag wine label. The year is 1977. The wine is an Elderberry Wine produced by Geoff Weston. 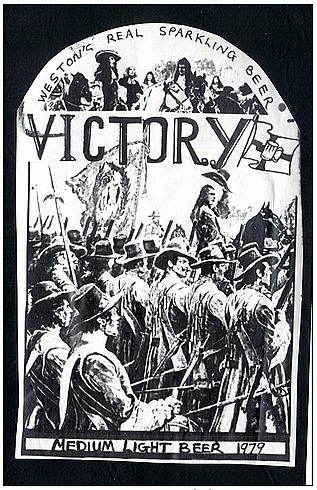 The Flag Wine label was hand drawn and printed on very old photographic gummed label paper. 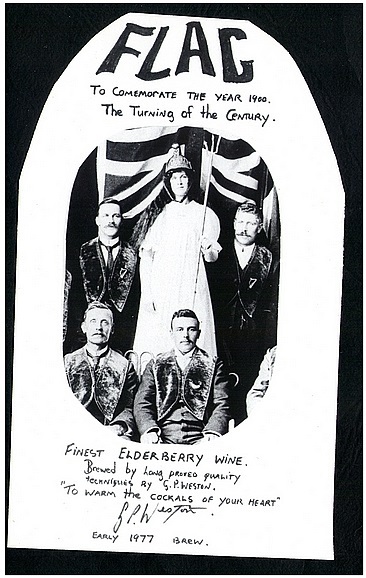 This is called a primitive label because it was a forerunner to the first Weston's Winery in Berwick St, Dunedin. Flag wine was made in quantity at Forresbank Avenue where the Weston Winery now stands but was then just for private consumption. It is believed that the women in front of the flag was a grandparent of the Weston Family which makes this an interesting historical item for the family. 1977 Primitive forerunner wine label. Old gummed private wine label. Hand-drawn and printed on very old photographic gummed label paper. This is called a primitive and was a forerunner to the Weston's Winery in Berwick St, Dunedin. 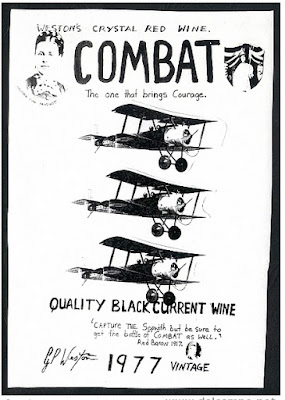 Combat wine was made in quantity at Forresbank Avenue where the Weston Winery now stands. The label has a supposed quote from the Red Barron:- "Capture the Sopwith but be sure to get the bottle of Combat as well." Red Baron 1917. Year: 1979. Old gummed private beer label. Hand-drawn and printed on very old photographic gummed label paper. This is also called a primitive and was a forerunner to the Weston's Winery in Berwick St, Dunedin. This was about a year before the first wines were made there. What is interesting here is that Geoff Weston also tried his hand at beer making as well. 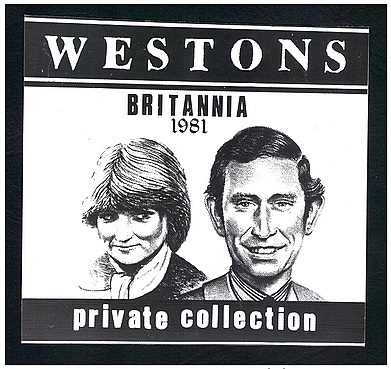 Britannia 1981 was the first commercial wine label of Weston's Winery in Dunedin New Zealand. Commemorating the engagement of Charles and Diana, this is photographic label produced from original artwork. The backing would have been stripped and the thinner paper hand glued to the bottles. 1983 limited run for the 9mm Society mini-conference held in Dunedin March 1983. 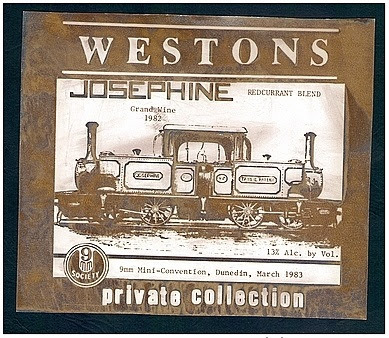 Josephine is the tank engine that worked up and down the line from Port Chalmers to Dunedin and now stands in the Dunedin Early Settlers Museum. The labels were dyed by a food dye process into a range of colours so that each wine bottle was unique. The backing was stripped off and they were hand glued to the bottle. This label was a reject owing the smudges and still has the backing. 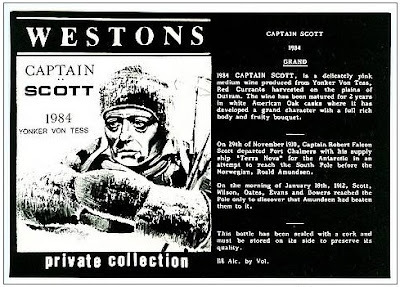 1984 Captain Scott wine label. 1984 wine label from Weston´S Winery. This is a superb gummed wine label. 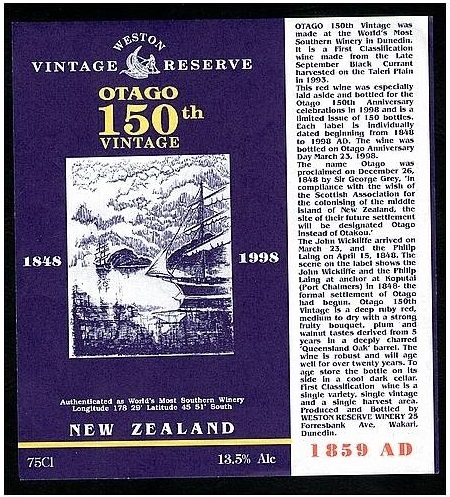 What is so interesting about this label is that not too long after the New Zealand Wine Post would become involved in the shipment of mail via the Antarctica Post service between New Zealand and the South Polar Base. 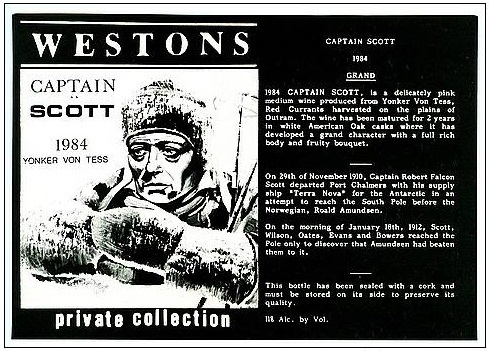 The label carries the usual description of the wine and then goes on to give a short account of Scott's final trip to Antarctica. It is this latter part that I've added below. "On 29th of November 1910, Captain Robert Falcom Scott departed Port Chalmers with his supply ship "Terra Nova" for the Antarctic in an attempt to reach the South Pole before the Norwegian, Roald Amundsen. 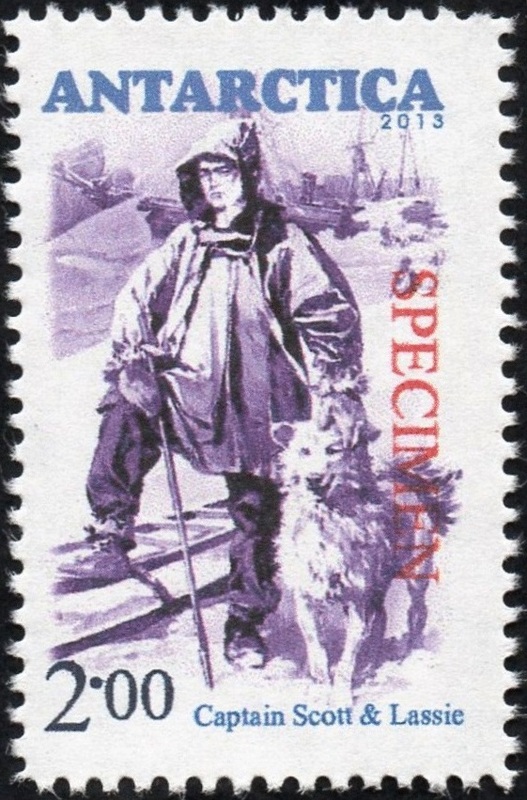 On the morning of January 18th, 1912, Scott, Wilson, Oates, Evens and Bowers reached the Pole only to discover that Amundsen had beaten them to it." Antarctica Post - Page One. $2.00 Captain Scott & Lassie. 1984 Jean Batten Ride Wine Label. A red currant wine from the old Berwick St winery. Jean Batton was the first to fly from London to Christchurch in her aircraft Percival Gull. The flight opened the way for commercial air travel from London to New Zealand. This label commemorates the historical nature of this event. Westons Private Collection wine. Falklands 1985 wine. One of a series produces especially to commemorate the War featuring the Army Airforce and Navy. 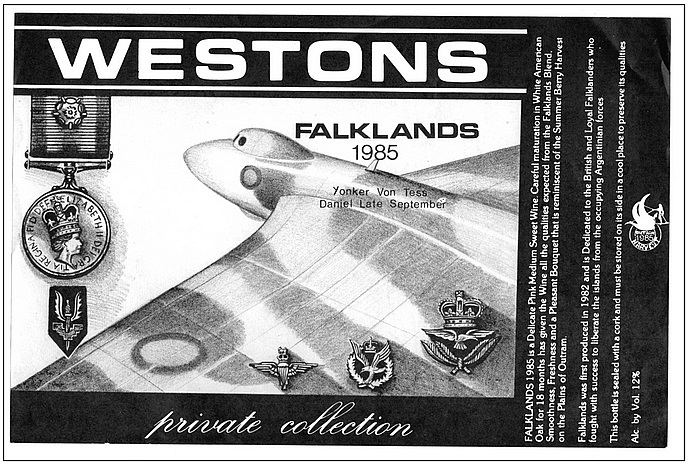 There were two produced for the Airforce- this Vulcan Bomber label and the Harrier Jump Jet label. This is the Vulcan Bomber that flew from Britain to the Falkland Islands and bombed the runway. Various campaign medals also feature. Gummed Arabic on beautiful paper. Quite a large label but was used on standard 750 ml bottles. Fantastic artwork by a local artist. Lithographic Offset printing in rich Black and White. 1986 Luna Eclipse mint wine label numbered. 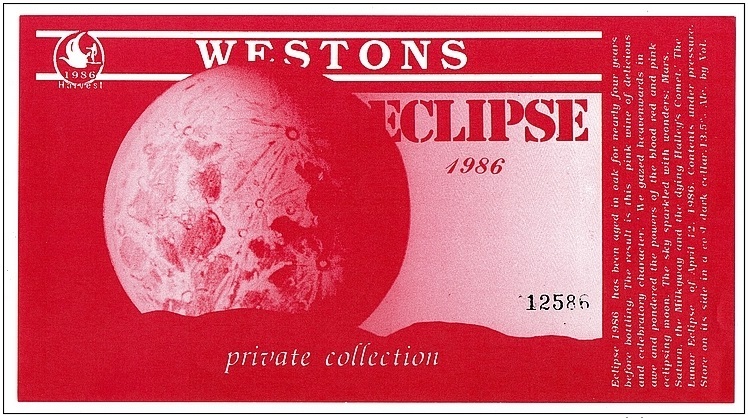 Eclipse Wine Label 1986. This is a beautiful label. Gummed. Printed offset lithography. The image here suffers from the screen which is perfect in the original. Numbered with a special number. 12586. The number is 12th day, of the 5th Month (May) 1986 (86). The date of the Luna Eclipse and also the last time Halley's Comet was seen. In addition, Mars, Venus, Saturn, Jupiter were all in the night sky as well on this night. All mentioned on the label writing. Very rare item of a famous pink wine from the World's Most Southern Winery. 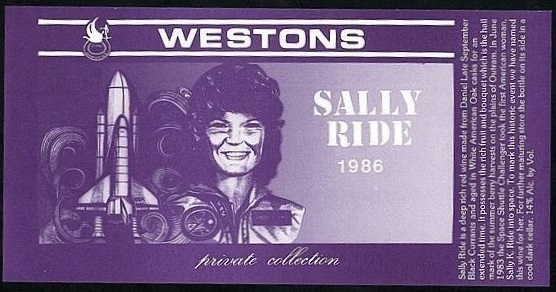 1986 Sally Ride Wine Label. Sally Ride (first USA women in space) wine label of Weston Winery Private Collection wine. A superb label on nice gummed paper. Sally Ride Wine was one of four featured in the Winepost Definitive issue of 1992. 1992 - 5g Sally Ride. 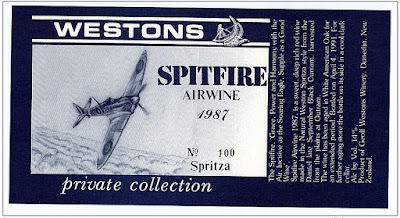 1987 Spectacular Spitfire wine label numbered. 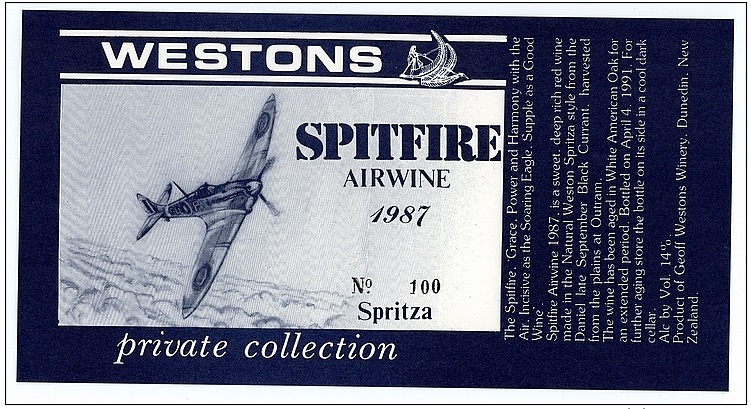 Spitfire Wine Label 1987 vintage. Gummed. Numbered 100. Unique and beautiful wine label from the World's Most Southern Winery in New Zealand. This was quite a famous red wine. Not long after this it became known that Weston's Winery might be able to establish their own postal service for their mail and wine. Later a design was worked on that would eventually become the first WinePost issue in late 1990. 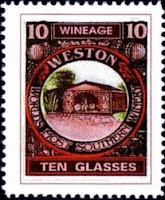 Now we have moved into the NZ Wine Post years where Weston's Winery had begun issuing stamps for their own postal service. Designs on their wine labels and postage stamps continued to be freely exchanged. The Winebird & Weston's Winery. 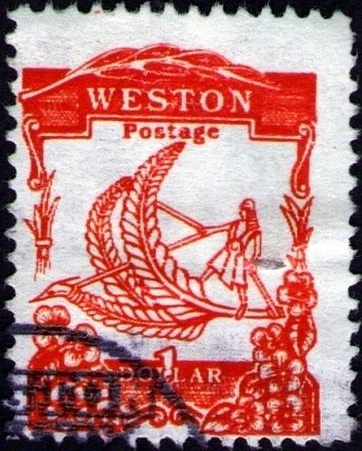 Both designs seen in the label above were also used in the NZ WinePost stamps below. 1990 Winebird. 1995 Weston Winery Definitive. The 2008 vintage of Iceberg Chardonnay featured a group of penguins. For the 2009 vintage, a ship in the ice was used for the Iceberg Chardonnay. 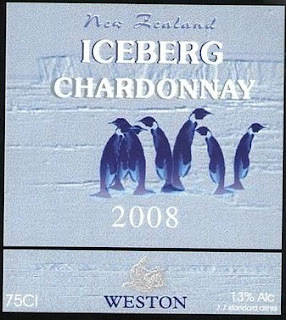 Both these labels highlight the interest that NZ WinePost has in Antarctica those their issuing of their Antarctica Post stamps. 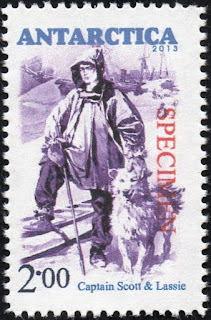 Antarctica Post began issuing stamps in 2002 for mail between New Zealand and the NZ & USA bases in Antarctica. 2017 Wine Post Old Wine Labels Issue. 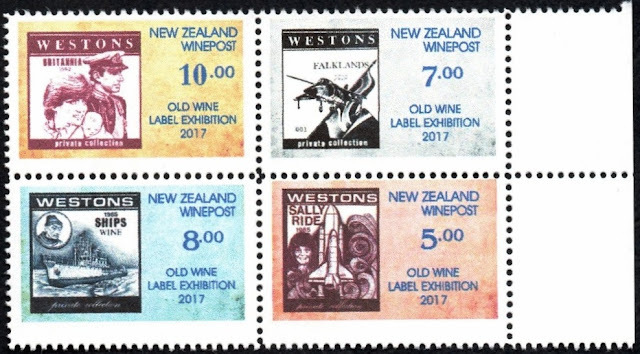 In 2017 NZ Wine Post issued the four value set celebrating the connection between the Westons Winery labels and NZ Wine Post stamps. As this page has shown, there is a clear interchange of designs between the labels and stamps. Some other items appeared after WinePost began issuing their stamps. While it could be argued that this is not connected to the stamps they do have interesting stories behind them so for that they made it into this post. New Zealand Wine Post Currency. 1982 Wine from the Vault issue. Primitive forerunner wine money. Wine from the Vault issue. One Bottle. 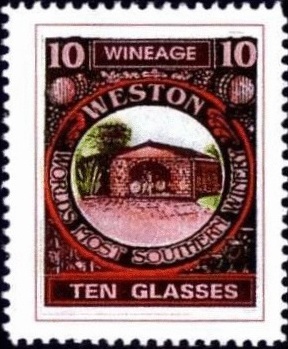 An amount of these were issued to the shareholders in Weston's Winery that was originally at the Berwick St location. 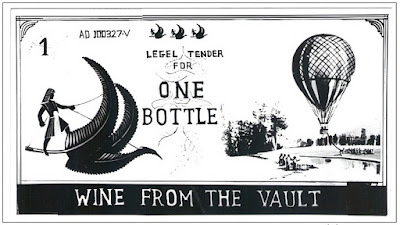 When redeemed to the winery treasury a bottle of wine could be lifted from the Wine from the Vault stock. This dates from about 1982 and was a precursor to the Fiscal stamps printed a year or so later. This is on photographic resin paper and is quite rigid. Small mark across the reverse side which is blank. Even at this early date the WineBird Logo was being used and has been retained into the present winery. The other side shows Mount Aspiring which was also featured on a Winepost stamp in 2013. Year: 1992. Perfect Condition: New Zealand Wine Banknote. Issued by Reserve bank of Weston Winery- the World's Most Southern Winery. Printed both sides with the number on a woven paper. Small size. 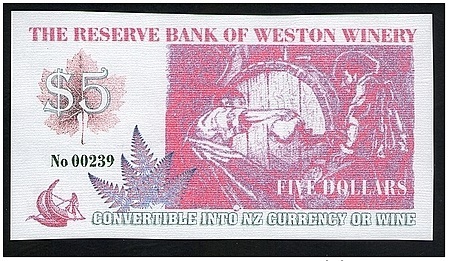 These were issued at the Dunedin Food & Wine festival for the purchase of wine from the Weston Winery tent when New Zealand cash ran out very soon after the Festival opened. They were issued as change for New Zealand currency as smaller denomination New Zealand banknotes ran out. They were accepted and used quite happily, even being honoured at other tents for any of the products. 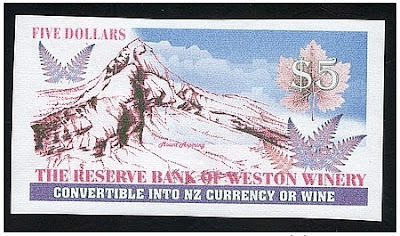 They were converted back to New Zealand Currency if required later in the day and other participants could convert them back to New Zealand Dollars any time during the day. This is an uncirculated $5 note. Unique and very interesting. New Zealand Wine Post 1990 - 1999. New Zealand Wine Post 2010 - Today. 1995 - 1G taking wine. 2013 - $3.00 Mt Aspiring. 1998. 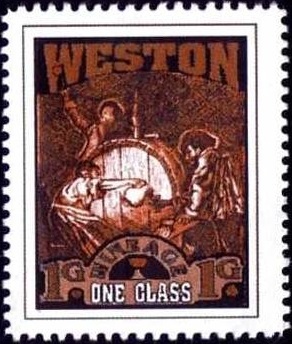 Weston Winery special wine label. 150 years. 1848-1998. Great story and write-up. Print dated 1849. Each label was printed with a single year date up to 1998. I see your WinePost collection is continuing to expand. Nice collection of wine labels and I can see how they relate to the stamps with common designs and themes. Now a comment you make regarding this page only being linked via the main WinePost pages. Why is this? This is not a post about stamps. As clearly stated above they are wine bottle labels. For that reason this post almost didn't make it into this blog. Its just its connection and relationship to my other Wine Post pages and the development of Wine Post stamp design that makes it of some interest. Therefore we've decided to make this a little hidden gem which will only be found by those who go into and study my other pages. Hi Mary - Hope you remember me. This Winepost section has turned into a big project. Bigger than I expected it would be. I've followed it closely as its grown from just one page and discovered how new or better quality stamp items have continued to arrive. I have a feeling this process will continue for quite a while. Yes Bill, I remember you well. Yes and it will continue to grow as we find new items. I have followed the development of your New Zealand Wine Post collection with interest as I too have an interest in wine. I am a wine maker from France. Of special interest to me was this collection of wine labels. Labels are important to any wine as they are often the only information a purchaser might have as to the bottle's contents. The promise if you will. Now Mary, I wonder why you haven't done more to link these bottle label designs with the stamps when there are two of three very obvious ones. How are you, Rochelle and Nadine? I agree with you. I had not established enough links between these labels and the stamps so I added more links, comments and stamps to this post. I hope it is clearer to see the relationship between the labels and the stamps.